Not all User IDs created for an account can perform the same functions. Refer to Understanding Digital Identities and Account Types for more information. 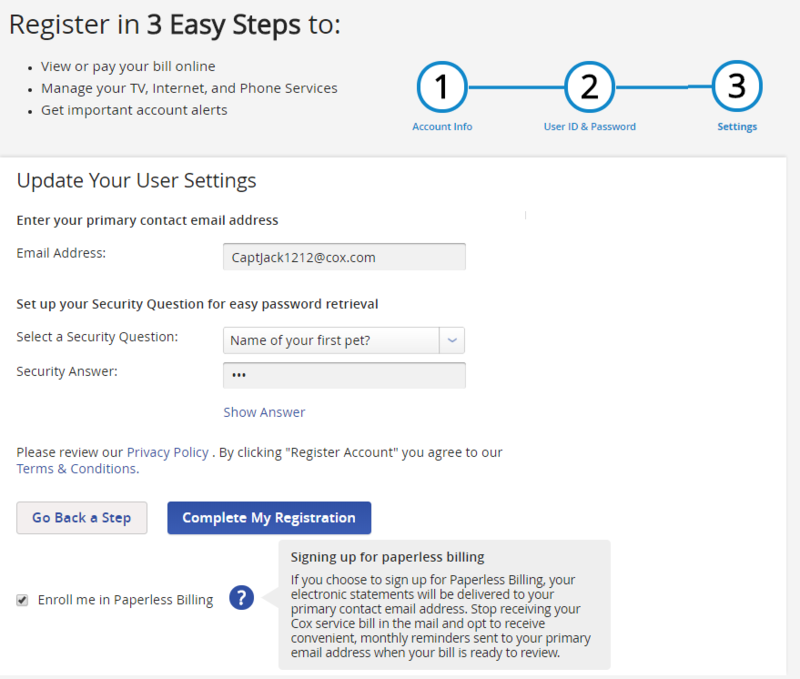 View/Pay Bill - Provides secure access to your Cox statements, bill payment page, and services such as EasyPay, Stop Paper Bill, and Email Reminders. My Account - Permits you to set up or change your personal account settings, such as Nickname, Password, PIN, Security Question & Answer, Privacy Settings, Authorized Users, Billing Address, Payment Methods, and Contact Email Addresses. 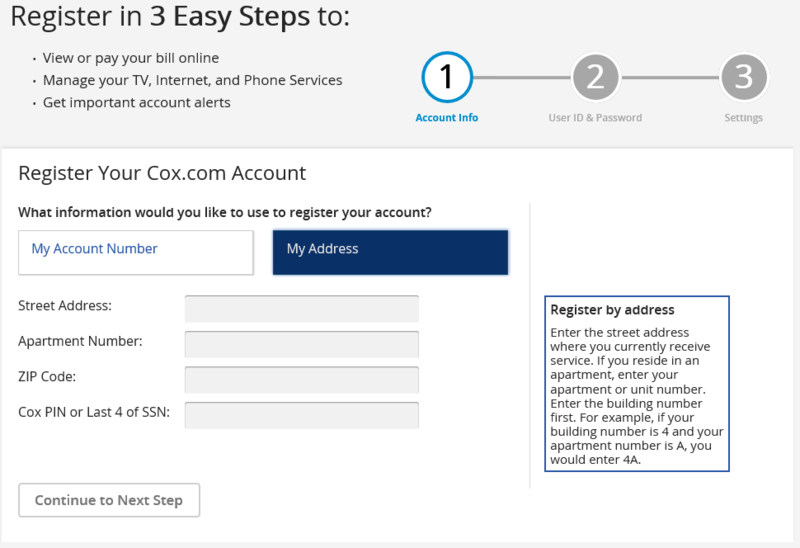 My Services - Provides quick access to all of your Cox online services. 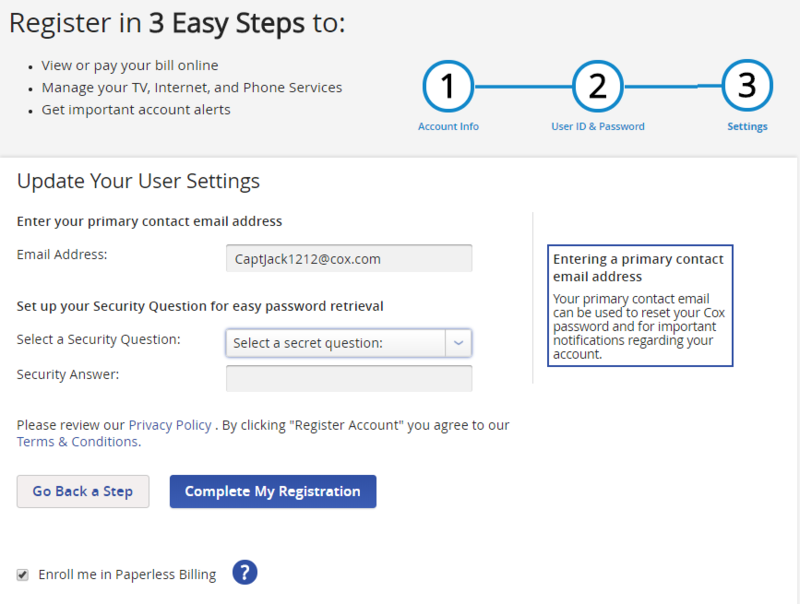 Cox Email - After opting in, provides secure access to your personal Cox Email services. Voice Tools - Provides secure access to your personal Cox Phone webpages. Click Sign In My Account at the top of the homepage, then click the No Account? Register now! link to create a User ID and password for the first time. If you already have a current User ID that you have forgotten or need to reset a current Password, click the Sign In link. Then click Forgot User ID / Password? and follow the prompts to reset your User ID or Password. 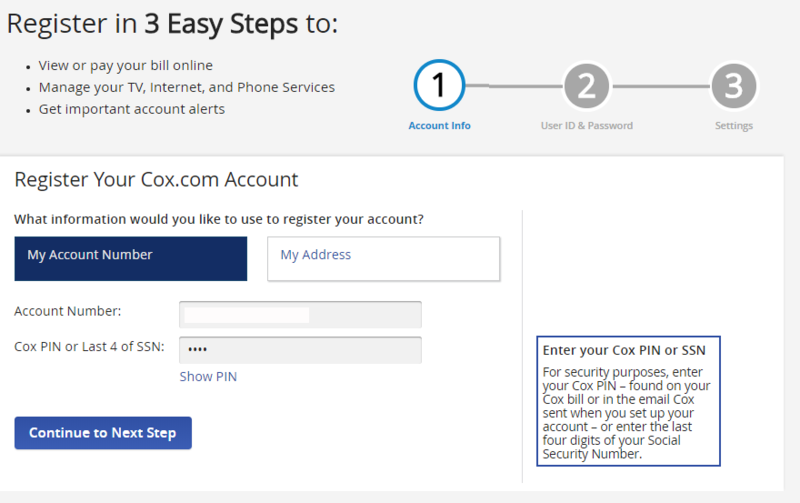 In the Register Your Cox.com Account section, select the method in which you would like to validate your account and enter the required information as shown on your Cox bill. : You may be presented with a Security challenge. This can vary and may appear before progressing to a new screen. If there are multiple matches for the address you entered, you will be prompted to select the correct one. 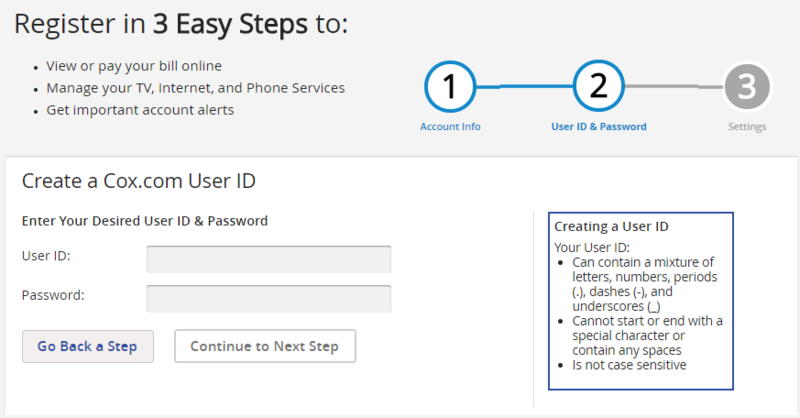 Enter the required information to create your Cox User ID and Password. Enter the User ID you would like to use. Enter the email address you would like to use to validate your account. An incorrect or invalid email address may prevent you from being able to receive important notices, or complete the Bill Payment process online. Uncheck the box if you do not want to enroll in Paperless Billing. Result: The email address you entered will receive a Validation email. Open the email and follow the instructions. After the validation is complete, you will be taken to the following screen. 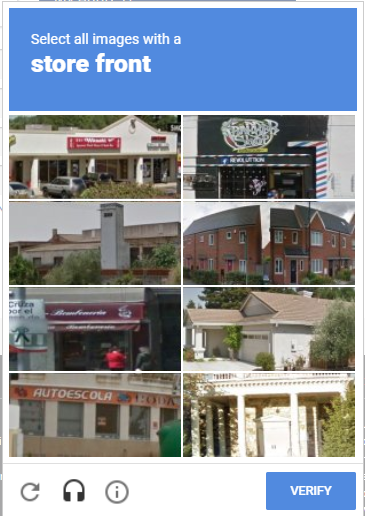 The following image displays once you have completed the account registration process, prompting you to log into your account. To update your account preferences including having your PIN printed on your bill, opting in to Cox Email, your preferred contact method, your preferred email address, and setting up secondary user IDs, click View Profile and continue to the next step. Select your desired settings for customizing your PIN and bill delivery options, then click Save Billing Preferences. Enter your Preferred Email and select your desired settings for how you want to be contacted then click Save Contact Preferences. Result: The Add Authorized User window displays. Fill in the required fields for the Authorized User, then click Submit. Note: If the Security Challenge doesn't display, you may need to disable your ad blocker and refresh the page in order to continue. You can now click the MyConnection link to login into My Services.